I have used these since the 80's (called Maxima then - each pack had a free pick, too) and I thought they stopped making them completely. When I learned somewhat recently that, well, 'here they are' I've used them exclusively. I have several guitars and like how the strings are fresh whenever I pick one up. Another review here stated that they last years - and this is true. Currently going on 20 months now. ive used these strings since the early 80' when they were called maxima strings..i use 010-046. they last and last..my friends used to give me a hard time about them as i was paying $15, a set as they were paying $5 a set i asked them how often they changed strings they said every 3 weeks, i told them i changed mine every 4 months, so thats 1 set of the gold strings every 4 months at $15, to about 5 string changes of there strings at $5 total of $25. now who pays more for strings ,i showed then these figures, they never gave me a hard time again.. I have had these on my Brian May signature for almost two years now. The gold doesn't tarnish and consequently they last longer and actually seem to be getting better with age, so why change them? 9-42's lasting two years, well that is simply exceptional. I love these strings, you will too. Best Strings for my guitar to date. 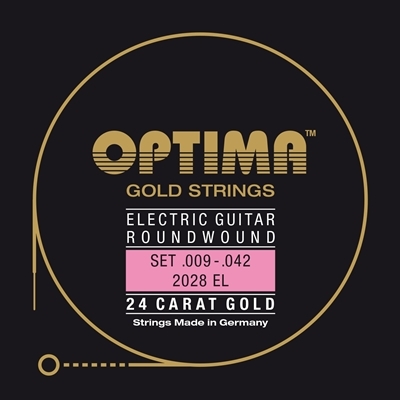 Tried them all and ended up at Optima Gold String. Tried different gauges for 10 to 8. Maxiflex addresses the issue I had that they were hard to bend except the 8's. So these feel in between 8 and 9 but sound the same as the 9's.This lets me dig in the notes harder and still last longer than any other strings I've tried. Optima Gold has a shimmery top-end no other strings seem to deliver.